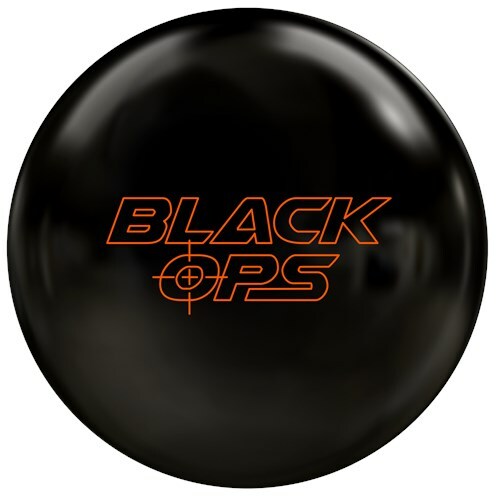 Description: Covertly dominate your competition with the 900Global Black Ops bowling ball. This ball employs the low RG and super high Diff Break asymmetric core with the S70 solid coverstock to authorize an attack on the midlane to backend hot spot that conquers house and sport lane conditions. Drilled my Black Ops pin down with a 4 inch pin to pap, also has a p3 hole. I have been able to use this ball on every pattern that I have played on. Especially rolled good on the 2015 Team pattern and the 2011 Masters pattern. Coverstock comes 1500 grit polished and I touched the surface a little with 4000 grit by hand. If you are looking for a fairly aggressive ball that will cover boards on the backend this is by far a great ball for that. It has a very predictable motion even with the backend movement and continues through the pins great at the pin deck. I would recommend putting one of these in your tournament bag. Was able to play up the outside on the 2015 Nationals pattern with no problem at all. Great recovery from out there. On the 2011 Masters pattern I was able to move a little deeper and get it to recover with good pin carry. The Black Ops reminds me a lot of the original Dream. It has a lot of length through the heads and a strong flip on the backend. By the numbers, the Black Ops is one of the strongest balls in the 900 Global lineup, but I would say it is a board or two less downlane than the original Dream. This will problaby be the first ball out of my bag on most nights. I can always ball up to the Dream Big and ball down to the Respect Pearl. With its solid S70 cover paired up with the proven Break asymmetric core, this ball will be great for a multitude of lane conditions even when they get dry because you will be able to move inside and still get the ball to feed. Here is a ball with the same shape core as the BREAKDOWN with a completely different reaction and its called the BLACK OPS. This ball flat out hooks..... so much so that I had to put some surface on it to calm down its box finish. 2000 grit abralon works well for me and by doing this I think it will allow me to throw this ball on a wider variety of conditions. This ball might out hook any in the 900 Global line and is well worth its mid-price point..... definitely a bunch of hook for the money with this rock. This ball will work well on a higher volume of oil and those longer patterns you might encounter. Again changing the density of the core from the previously released BREAKDOWN will do wonders in ball reaction. So don't get left out and remember to get some performance for YOUR game. How many ball companies can say they have produced a true big asymmetric core at the mid price point? 900 Global has done just that! The Black Ops combines the S70 solid cover with the Break asymmetric core. OOB with its 1500 grit polish, this ball will give you enough length and down lane motion to cover most conditions. This ball is extremely versatile. My Black Ops is drilled pin up above middle finger with the mass bias right next to the thumb. This is about a 5 inch pin from axis and about 60 degree mass bias. I have kept the ball at OOB. This ball for me provides more length than the Respect, with a quicker motion down lane. What I really like is so far I have been able to throw it on almost anything. I have used it on all house shots except for extreme dry and I have thrown it on Bear and Viper when the lanes transition. This ball is quite possibly the biggest bang for your buck. Big Cover and Big Core at the mid price point. You really can't beat it at all. If you haven't tried 900 Global, give this ball a try. You will not be disappointed. If you are throwing 900 Global, this ball will fit your arsenal perfectly. If you have any questions, please let me know. The Black Ops gives you the asymmetric core reaction at the Mid-Level Price Point. The Black Ops has paired the Break Asymmetric Core with the proven S70 Cover, combined with a smooth 1500 grit polish to make this ball not only perform on the lanes but raises eyebrows by its stern looks. I used this ball on the Kegel Bourbon Street Pattern (40Ft at 23.45 Ml) and the D/S event at Nationals. This ball will fit perfectly in between my pin down BreakDown and pin up Respect. The Black Ops gives you a consistent roll in the mids with strong backend reaction that will be the first ball out of the bag on most occasions. The versatile and proven S70 cover will also give you the ability to adjust surface easily that will allow you to dial in your ball reaction for multiple patterns. Don't let oil deception get in the way, just call in the 900Global Black Ops! Performance for YOUR Game! The Black Ops secretly brings back two all-time 900G favorites in the S70 Solid coverstock and Break Asymmetric Core. This is a combination that has had unparalleled success at the USBC Open and on tough lane conditions in general. Finished at 1500 Grit with polish, the Black Ops will have the perfect benchmark ball reaction. Good length, great mid-lane read and a strong, controllable backend reaction. This is my absolute favorite ball in the 900 Global line. I took the surface down to 4000. This is the first ball out of my bag when bowling tournaments on tough conditions. The Black Ops is very clean through the heads and gives me a good idea about how the pattern is going to play. The Black Ops has a great ball motion with the predictable mid lane read and strong back end reaction. I am able to play multiple angles with this ball and not give up carry. This ball keeps the pins low on the pin deck and hits Hard. This is also one of the few asymmetrical balls that you can get at this price point. Best bang for the buck on the market. The Black Ops brings together the proven Break core with the reliable S70 coverstock....an outstanding combination. Out of the box condition has the Black Ops getting a lot of distance, but making a very strong back end reaction. I've found the coverstock is very receptive to alteration. You can bring down the surface to get the ball to start sooner, while calming down the backend, but not lose the hard driving motion of the ball through the pins. Drilled my Black Ops pin up with cg kicked out at 2". WOW This ball gets thru the heads with ease with its polished out of the box finish. The Black Ops brings a very good Break core with my favorite S70 coverstock. this ball will clear the heads and start reading the mid-lane making a very strong backend reaction. this ball gives you the performance of a high end ball at midline price point. This ball will definitly give you more bang for bucks. This will be the first ball out of my bag whether I am bowling on a house shot or a sport pattern because of it`s energy retention thru the pins. Thanks to TJ and the Staff at 900Global. For another great Prouct. most oil patterns. The shiny cover gets the ball through the heads with ease and then releases a powerful strong arc to the pocket. My ball speed is 15.2 mph, I drilled my Black Ops 3 inches pin to pap, psa to pap 6 ½ inches and pin buffer at 2 ½ inches. I can use this ball on mostly any condition with a medium-to-medium heavy oil volume. Another great control ball from 900 Global, you should try one. This ball can be the first ball out of your bag. On league shots or sport patterns 38-44 ft. This ball is very clean through the heads for an asymmetrical ball. It has strong mid lane roll and strong back end continuation. This ball has s70 cover with a low rg and a high df, which makes this ball very versatile with 1500 grit polish. This could be a great benchmark ball for all types of bowlers. I compared the Black Ops with the Break Down when I first used it. I LOVE the Break Down and with the Black Ops having the same cover I knew I would like this one. This is a GREAT compliment to the Break Down. When the Break Down is too soft off the spot, the Black Ops is the ball to go to. For me the black ops is 5 boards stronger with the layout I have on it (35x4 3/4x45). It is still very clean through the fronts with more angle in the backend. The Black Ops is a PHENOMENAL release from 900 Global. This ball gives you length, angle, versatility which will help carry the corner pins later in the block when the pattern begins to carry down. The Black Ops from 900 Global brings back a core and cover combination used on proven winners The Break & Eagle. By using a polished finish on the S70 coverstock 900 Global has given us a product that gets through the front and middle part of the lane and stores up energy for the backend. This results in an effortless push down lane with a powerful yet controlled motion in the back that seldom over-reacts. A must have in every tournament player's bag!!! Black ops drilled with pin in the ring, cg at 35 degrees gives the ball a nice smooth roll through the front and mid part of the lane. The backend is a nice snapping motion that continues through the pocket. I've used this ball on all PBA lane conditions and this by far is the best ball to use if you want to read the shape and break down of a pattern. This is THE benchmark ball to have, you can use it on nearly all lane conditions. Adjusting the surface to 1,000 grit can start up the same motion early and still get the backend of the ball that continuous motion. Great ball created by a great company! Keep up the good work 900 Global!